Our hearts, prayers and thoughts will be with the victims and families of September 11th, 2001. We will never, ever forget them. God Bless each and every one of you. Beautiful weather, good friends and a wonderful Trail. We had two great days for a hike. The weather was about 85 degrees both days. The sun was shining and the rain was no where in sight. the evening with Michael and Alex. Quiet night of chatter among us hikers and getting acquainted with new hikers. Nice relaxing evening. 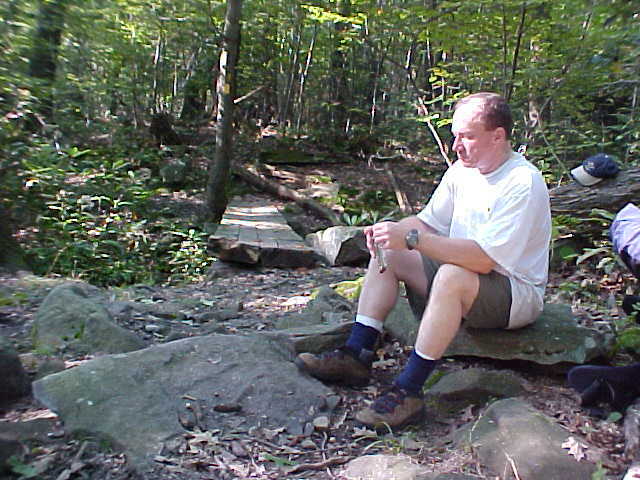 The next morning, after getting the cars shuttled, we hit the trail about 10AM. Had a few ups and they wore me out. It was beautiful weather and the day was great. 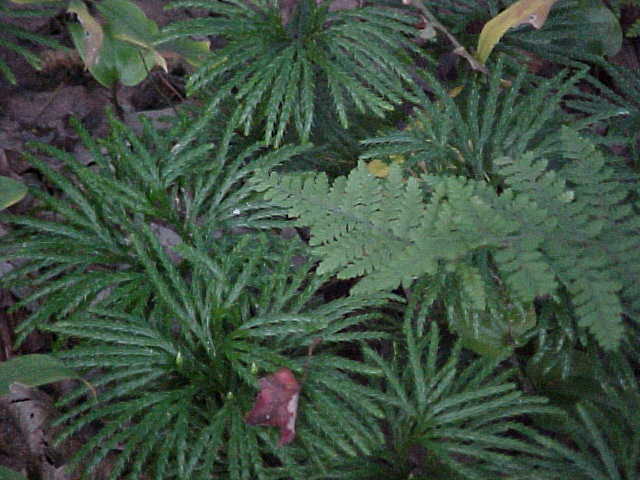 We saw lush fern growth along most of the trail Saturday. There were approximately 5 ascents that were about 240 feet each. One journal entry in the mailbox at about the 35 mile marker stated that a bear had been sited at mile 44 that morning. We would have loved to see a bear. Just not too close! We found the side trail for the shelter as posted. It was just a very long trail there. 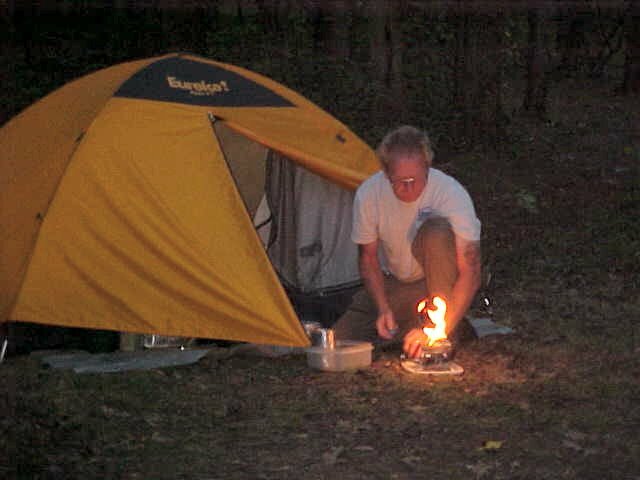 Once there, we set up tents and just hung around and I nursed my sore legs. I guess it was the ups or maybe being out of shape. The water from the pump was not in real good shape. It was rusty and needed filtering. Filtering, however, did not remove the nasty sulphur taste. After filtering, I boiled it for tea and dinner. Some drank it right after being filtered and experienced nothing but bad taste. Dinner was great Saturday night. We had a good time around the campfire as usual. I must say it was a pleasure having another fellow Marine among us. Some of the humor that night, might have only been appreciated by Marines. I sure did enjoy it! Sunday morning saw everyone up bright and early. Everyone was feeling good physically and mentally. We were ready to hit the trail. After breakfast and teardown, we hit the trail about 8AM and found yet another gorgeous day. of any significance. The flora went from Ferns to Mountain Laurel. Some of the trail made me feel as if I was in lush South American Rain Forest. 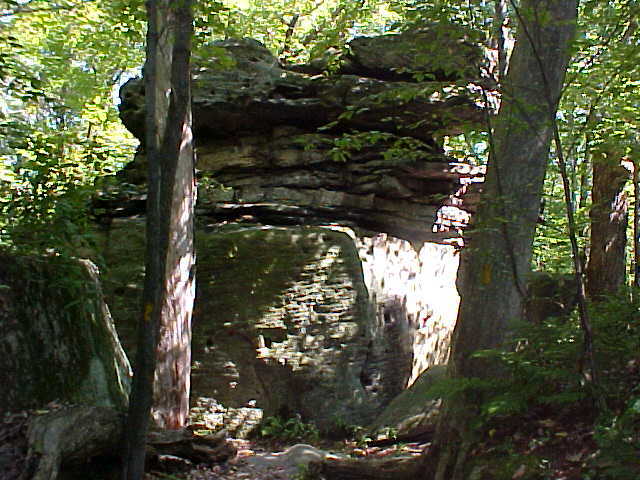 There were huge rock formations that were beautiful and the trail wound around and through some of them. We saw more people on the trail Sunday then we did Saturday. We ended the hike around 1:30PM after we all gathered in the parking lot. After picking up cars from the trailhead, we all met at OakHurst Tea Room in Somerset County. Great meal! Great Freinds!! Great weekend!! We were in Somerset County where the 4th Airplane went down. What a feeling of sadness for all of the victims of the devastation that struck us Last Tuesday. There were true heroes on board that airplane. They died saving many lives and protecting our country from invaders. They do deserve the Nations highest award. Please show your support for this Nation as we need to show the President and the rest of the World that we are a United States and will not tolerate any such acts ever again. Our basic freedoms have been challenged. There were hard working people just sitting in their offices doing their jobs. These jobs had nothing to do with the Nations defense or military jobs or National top secret jobs. Until we prove to the world that this will not go unpunished, we will not feel safe in our homes and workplace. Please show your flag and your support! Thanks for letting me sound off. 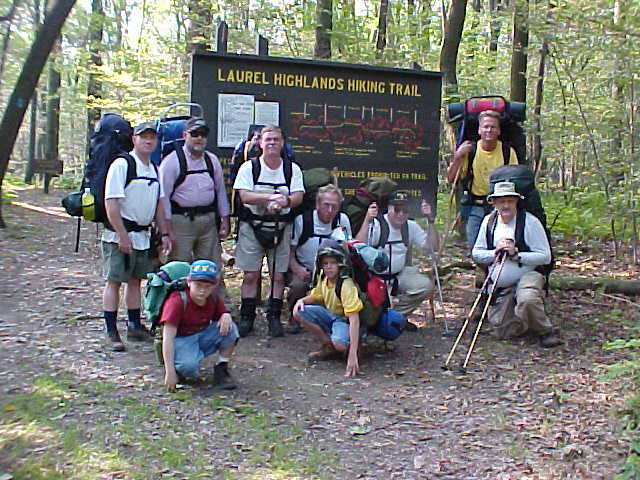 The whole group at the trailhead. Rich at lunch, day 2. 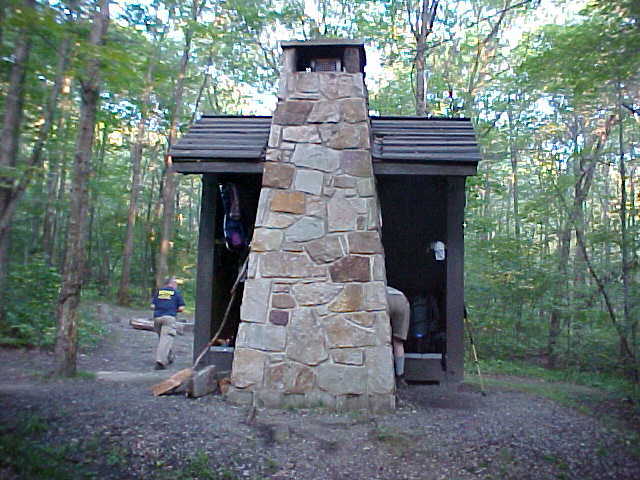 Shelter 5 at mile 37.5.